American actor known for films such as Ferris Bueller's Day Off, Young Guns II, Star Trek: Generations, Speed, Twister and Three for the Road. On TV he played Stuart Bondek in Spin City. In this photo I had about 0.4 inch more sneaker than him. 1/4" is so small of a difference, that many people won't be able to spot the difference at first glance. But if you look closely for a while, you can tell that Alan is a tiny bit taller than the woman. 1/4" can easily be negated by postural and/or footwear differences, so I can understand how some people like you would believe that there's no more than 1.5", and some people like me believe there's 1.75", although I believe that the latter's more accurate. Well, we're gonna have to agree to disagree. I see Alan being a tiny hair (like 1/4") taller than the nearly 177 woman, although it's not by a big amount obviously. But no need to have another long heated argument over this type of stuff, despite you trying to provoke me. I could see both figures being possible. Today I think he has shrunk a fraction more than 5 years ago when I saw him. There's a 1.75" difference in the pic worst case, but not 1.5". You have to consider the fact that Rob has slightly thick hair, so some of his hair doesn't count. Alan can look 5'10.25" worst case but not shorter than that. Actually, you're wrong too, Christian. He does look about (and no more than) 1.5 inch taller than Rob in the photo above. Add 0.4 inch for less footwear, and he basically comes in at just about 5'10 flat here, all things considered. Just finished watching Dirty John and he's in one episode. Didn't think it was him initially because when he stood next to Eric Bana he looked tiny! From Ferris Bueller he looked around 6ft, certainly remember him being lanky and tall and towering over Matthew Broderick. Maybe he's shrunk and/or Eric Bana is taller than what he says he is? Anyway, from Dirty John he looks around 5'9. today he could have lost more height, with 6ft 6 nicholas braun Here. Charlie and Bobby are both wrong. Not 1 inch but not 3 inches either. Looks 2 but with footwear differences, it's more 2 3/8" so Junior's right. He's about 5'10.5" as listed. What? He doesn't look as short as 5'9. He visually looks around 3 inches taller than Rob. Look 5'10 1/8 with Rob. But Rob mention he have 0.4-0.5" more shoes so 5'10.5" was right. correction on my previous comment. I stated that he looked 1.5 inches taller. I zoomed again. I used a ruler and calculated from the top of the head to the middle of the eye that's the center. I got 1.25 inches taller than Rob. But then Rob looks like he is slouched a little and his head is leaned a bit forward. Rob totally looks relaxed where Alan is standing straight like a Soldier. This would give Alan a half inch advantage. Alan is standing straight stiff as a nail. His neck is straight too. Many in the comment section will argue with what i'm about to say but here goes. Because Rob's body looks relaxed and slouched a little where Alan is standing as tall as he can.It almost appears Alan is deliberately enhancing his height. His posture is perfectly straight and his chest looks like its breathed in giving him some extra height. All this said i am going to say Alan is 5'8.75 but i'll round his height to 5'9" tops. 5’10.5” today, 5’11.25” in youth, he looked tallish/upper average in “Ferris Buellers day off”. He looks just over 5'10 here but could give a 5'11-6'0 impression on film during his peak. Editor Rob: I've no idea if he'll do another event any time soon...sometimes with guests, they do an event and aren't seen here for a long time or ever. I remember Pete Posthlewaite did the one LFCC and sadly passed a couple of years later...that was his only convention. To be honest I know quite a few guys in the low 180 cm range with his exact proportions. Long neck, low shoulders, normal to smallish head, skinny. I have no idea why but it is really common to me. Wow,I really thought he was apx 6 foot, shocked to read 5'10.5 ,amazing, shows how deceptive the tv screen can be! [Editor Rob: at any con I will be down to my low for most photos so a couple mm over 5ft 8.
i remember the days when most people here thought he was a legit 6'0. Good listing, rob! He looks 5'10" with you, but considering you have 0,5" shoes advantage, 5'10.5" is likely! I'm sorry I meant a legit 5'11, can you please edit it rob? This is a near perfect claim, he looked a legit 5'10 in the eighties. In contrast to most of the comments on this page, I actually think he looks a solid 5"11/180cm when considering the height advantage. Rob this guy looks under 5'10 , I know you have .5 footwear over him , but he still does not look 5'10.5 , I say only if he has poor posture. I give him 5'10 . 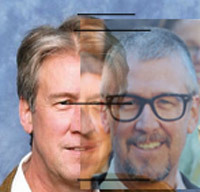 Yes, Alan Ruck, 180 cm and now, 179 cm. Ferris Bueller's Day Off is forever. In the 80's he did look a solid 5'11"
His neck and head alone are probably 5 ft :-) His neck and head proportions are really unusual. Of course they'd book this guy to appear at a UK con when I'm away from the UK... lol. I'm going to assume he's high priority on your list, Rob, especialy with the winter LFCC's lineup being a little sparse compared to summer? He looks at least 5'11''-I'd say he was 6'0'' max. He gets most of his height from his head. If his head was normal he would be 5'10. He's quite slim which makes him look taller. But I think he could be 6ft. He did look a lot taller than Matthew Broderick in Ferris Bueller. His long,narrow head and face makes him seem a little taller than he realy is, I have noticed that long faced people seem or are thought of as taller then their acctual height. Alan does look 5'11.5 or even up to 5'11.75 , I too thought he was a bit taller. Interesting. For some reason, I had alwas pegged him as closer to 6'2". Probably due to the fact that I remember him best from Ferris Bueller where his co-stars were quite short. Looks like he got could 6ft if he stood straight. But I see 5ft11 in this pic with Mamun. Yes , 6 days a week . And Superheros never reveal their ture Identities . mamum what nationality are you? the gym for two or three months in a row . ps . Is this uncle Joe from the Gym ? I read somewhere that you do weightlifting: do you do it everyday? In this picture only 211 pounds but now I am 226 pounds . Mamun what do you weight my friend? His EXTREMELY long head makes him look 6'2!! Its crazy!! He's pretty young. I don't think there's been any shrinkage from a 'peak height'. Pretty dead on here, i walked by him a couple or years back, I am exactly 6', not 5'11.5, not 6'0.5" and I had about a half inch on him. I love people that are my hight or even a little shorter and state they are 6'1" ,6'1.5", or even 6'2"/ Stop living a lie !!!! What is the big Fu_ckin deal - get a life people!!! It's part of the costume my friend ! "Supermun" hahahaha..sorry, found it amusing. No worries mamun, at least you get to meet them celebs ;). you will ever meet ! looks close to 6ft here with Super Mamun. Superman is who I am my friend . But please don't tell anybody . I bet the suit works as an ice breaker for the celebrities..honestly, not that it should be an Issue..
seeing alan as 1.82, barry bostwick (co star in spin city) must be real tall.! mamun, why are you always wearing this superman stuff?